Adopting Good Agricultural Practices results in a better quality of raw cashew nuts while stable, reliable linkages between farmers, processors and buyers is extremely essential for the competitiveness of African cashews. These are the lessons the GIZ/Competitive Cashew initiative (ComCashew) and the Sustainable Trade Initiative (IDH) have learned from years of implementing cashew sector interventions. The ComCashew Matching Fund was launched in September 2012 to leverage contributions from Processors, Farmer Based Organisations (FBOs) and Buyers and/or Retailers, as well as Public Research Institutions, to enable them to implement specific interventions or actions that lead to desirable outcomes for the cashew sector. The ComCashew Matching Fund is a unique public private partnership model and the only fund for cashew worldwide. The Cashew Matching Fund is managed by the Competitive Cashew initiative (ComCashew). The current call is commissioned by the German Federal Ministry for Economic Cooperation and Development (BMZ) and the State Secretariat for Economic Affairs (SECO) with participation by IDH – The Sustainable Trade Initiative. The ComCashew Matching Fund supports activities in either Improved Cashew Planting Material or Strengthening the Supply Chain of African Cashew. After the first call in September 2012, and subsequent calls in 2013 to date, there are presently 32 farmer linkage and research projects, with over 40 partners implementing projects amounting to € 11.48 million out of which € 4.54 million is contributed by the Matching Fund Grant.. Through the Fund, about 150,000 cashew farmers are supported in seven countries – Benin, Burkina Faso, Ivory Coast, Ghana, Kenya and Mozambique. Call for Concepts from the 7th December, 2017 to 7th January 2018, followed by review and decision making of the Matching Fund Board by the 26th of January 2018. Successful applicants would receive the go ahead to develop full proposals between the 29th January and the 28th February 2018. Contracting of successful projects will be done thereafter. Project implementation commences end of March 2018. VIII. Strong linkages and ties between processors/buyers and farmers (Effective Business linkage with farmers). During the last 5 years a traceability system was developed under the umbrella and with endorsement of the Competitive Cashew Initiative (ComCashew). The system is called 3S and stands for Sustainable Supply System. It is currently being implemented by front running processors in Africa. The 3S traceability system is a pre-competitive system that is governed by a separate foundation called the Sustainable Nut Initiative (SNI), in which all participants are represented. It is still closely linked to ComCashew. 3S is a Management Information System initiated by the Sustainable Nut Initiative (SNI). It is a secure, online software platform to manage and share product, process and supplier information, from raw material to finished product. 3S helps to monitor and manage value chains by linking data from all actors. Benchmarking and impact analysis in the entire supply chain provides essential management information. Depending on agreements between the partners in the chain, information is made available to each other. This type of information is key to steer productivity and to improve quality. All activities related to Expected Results I – VI are eligible to applicants operating in all ComCashew countries namely: Benin, Burkina Faso, Ivory Coast, Ghana, Mozambique and Sierra Leone. Activities related to Expected Results VII - VIII are eligible to applicants operating in Ghana only. Applicants from Ghana therefore could apply thorough both financiers. Maximum matching fund ratio of € 1 public funds (40%=maximum from our side) to € 1.5 private funding (60%) for projects. This holds for private applicants. With regard to public institutions, we target a ratio of 50% - 50%. In the case of grant offered by SECO successful projects would be supported with a maximum training grant of CAD$17.89 per farmer, a maximum seedling purchase grant of CAD$0.65 per seedling, and a maximum of 50% of the total cost of establishing seedling distribution centres (CDNs). Research or national extension agencies can apply alone, are however also enticed to work jointly with a private entity. Please download and complete Application Forms and submit electronically with all attachments to cashewfund@giz.de. In case of any questions please contact us through same email-address. The 33rd edition of the National Farmers day in Ghana is to be celebrated on Friday, December 1, 2017. Farmers’ Day in Ghana is celebrated to recognize the vital role farmers and fishers play in the socio-economic development of the country’s economy and to motivate them to produce more. The celebration of this day was instituted by the government of Ghana in 1985, following the highly commendable output of farmers and fishermen in 1984, after the bad agricultural output in 1982 and 1983. The occasion acknowledges farmers and fishers’ untiring efforts at feeding Ghana’s growing population, providing raw materials to the nation’s industries, and contributing significantly to the nation’s foreign exchange earnings. According to the Ministry of Food and Agriculture, This year’s National Farmers’ Day (NFD) celebration has been re-modelled to reflect and showcase better contribution of the farmers and fisher folks as well as the developments in the agricultural sector. The 33rd NFD celebration will be celebrated on the theme, “Planting for Food and Jobs”. Planting for Food and Jobs is a flagship initiative of the government of Ghana which is expected to be rolled out in all 216 districts across the country, and will involve the supply of farm resources such as high yielding and improved seedlings to participating farmers. The Competitive Cashew initiative (ComCashew) has since its inception trained more than 40,400 cashew farmers in Ghana on Good Agricultural Practices, Harvest and Post-Harvest Handlings as well as the establishment of Cashew Plantations. The objective is to increase cashew yields, better quality and to get the maximum farm returns that attract higher prices and increase farmer incomes. A total of 4,000 hectares of new plantation was cultivated with over 430,000 seedlings in 16 districts in Ghana. Additionally, the capacity of 125 grafters of which 90 are women have been developed with support from the Ministry of Food and Agriculture and other private actors in the cashew sector. Furthermore, there has been technical support to 7 local processors which has created approximately 5,378 new jobs. Currently, there is the trilateral cooperation between Ghana, Germany and Brazil on improved planting material development and cashew apple processing, estimated at €700,000. Also, a regional collaboration with Togo and Sierra Leone on improved planting material development and the establishment of cashew nurseries is ongoing. The Competitive cashew initiative wishes to say “ayekoo” to all gallant farmers in Ghana as we celebrate this year’s farmers’ day. The Africa Day for Food and Nutrition Security (ADFNS) was declared in July 2010 by the African Union Heads of State and Government at the 15th Ordinary Session of the AU Summit in Kampala, Uganda and has so far been successfully commemorated in seven times following its launch in Lilongwe, Malawi, on 31st October 2010. This year’s Commemoration of the 8th Africa Day for Food and Nutrition Security with Continental Symposium on Food Systems will be on 18 November 2017 in Abidjan, Ivory Coast. They contain less fat than most snack nuts, including groundnuts, almonds and pecans. The fats in cashew are heart-healthy monounsaturated fat. Cashew nuts are high in copper which promotes several physiological processes such as iron utilization and the elimination of free radicals, development of bone and connective tissue, the production of the skin and hair pigment melanin as well as vitamin E which prevent skin aging and tissue damage. Cashew apples are an excellent source of Vitamin A, B and C, high in antioxidants and minerals. Read more on Health benefits of cashew nuts and apples. The third session of the fourth edition of the Master Training Program for cashew value chain promotion in Africa has opened in Abidjan the economic capital of the Ivory Coast. The third session being the final of the fourth edition, will see some 70 participants from 12 countries being certified as experts in cashew value chain promotion. The Master Training Program is an initiative of the Competitive Cashew initiative (ComCashew) in partnership with the African Cashew Alliance (ACA) and is supported by other public and private partners. The ACP Group reaffirmed its commitment to developing cashew as a key commodity for several member states, at the 11th African Cashew Alliance (ACA) Annual Cashew Conference held in Cotonou, Benin from 18th to 21st September. The Conference, held under the theme: “A new vision for partnerships and Investments”, was officially opened by the Benin Minister of State, H.E. Abdoulaye Bio TCHANE, and was attended by over 400 stakeholders from 28 countries, including producers, processors, traders, exporters, government institutions, equipment manufacturers and service providers. Nine African cashew producers, forming the founding countries for Consultative International Cashew Council - CICC, met for the first time on Friday (29 September) in Abidjan, Côte d'ivoire. The meeting was preceeded by a ministerial expert concertation on 28.09, where representatives of the concerned ministries examined the founding documents. Born on November 17, 2016, The CICC brings together Benin, Burkina Faso, Côte d'Ivoire, Guinea Bissau, Guinea, Ghana, Mali, Togo and Senegal and represents the first international organisation for cashew producing countries in the world. The Cotton and Cashew Council (CCA) in collaboration with the International Consultative Council of Cashew (CICC) and the Research and Development Network on Cashew in Africa (REDAA), with technical and financial support from CORAF, PSAC and ComCashew, is organizing the International Scientific Colloquium on Cashew (CIESA 2017) on 26-28 September 2017 at the AFRIKLAND Hotel in Grand Bassam on the theme: "Agro-ecological intensification of production and transformation of cashew in Africa: Issues - Acquis Scientifiques et Technologiques - Perspectives"
Available statistics indicate that cashew is easily the most prospective, if not already the leading non-traditional export revenue earner in the country. There is therefore the need for the executive and all stakeholders to work together to promote the growth of Ghana’s fledgling local cashew industry. Undoubtedly, the cashew value chain brings a wide range of opportunities from production, through processing to the export of raw nuts. In the country’s quest to diversify and improve its commodity export bill, cashew has come to be identified as the produce with the strongest potential of ploughing in as much foreign revenue as cocoa has done for many years. The aspiration among key players in the cashew sub-sector of making Ghana the hub of Cashew production in West Africa is an indication that cashew cultivation has eventually evolved into a strategic economic sub-sector now meriting far more attention and care than it has received in the past. The steady growth of the cashew sub-sector may be largely attributed to the relative stability and the conducive business environment in the country and the concerted action of private sector players; Non Governmental Organisations (NGOs) and some state agencies to ensure a vibrant cashew sub-sector. India, the world’s largest processor of cashew kernels, depends heavily on imports of raw cashew nuts (RCNs), primarily sourced from Ivory Coast. While the Ivorian processing industry is still in its infancy, in the last decade domestic cashew factories have rapidly increased their capacity. This study is an exploration of how the cashew value chain is organized and what this implies for upgrading prospects in the Ivorian cashew sector. Its findings suggest that the cashew value chain is characterized by a bipolar governance structure comprising a trader-driven segment between Ivorian farms and Indian processors, and a buyer-driven segment that links processors to Northern end markets. An African Cashew Alliance (ACA) workshop in early August gathered information from market analysts and data collectors from nine ACA member countries to guide improvements and boost use of its Market Information System (MIS). The August 1-3 workshop in Ouagadougou, Burkina Faso—organized by the African Cashew Alliance with Trade Hub support — informed a draft action plan to increase service uptake for this subscription-based service, which has been online since 2012. The program which has been put together by the Competitive Cashew initiative (ComCashew) in collaboration with the African Cashew Alliance (ACA), with support from the Ministry of Food and Agriculture (MoFA) and the Cocoa Research Institute Ghana (CRIG), started from August 7 and scheduled to end on August 11, 2017. The aim of this unique Master Training Program, is to increase theoretical knowledge and practical skills of African cashew experts along the value chain and thus to further promote the competitiveness of African cashew. The Competitive Cashew initiative (ComCashew) together with the African Cashew Alliance(ACA), with support from the Ministry of Food and Agriculture (MoFA) and the Cocoa Research Institute Ghana (CRIG), will hold the 2nd session of the 4th edition of the Master Training Program for Cashew Value Chain Promotion from Monday, 7h to Friday, 11th August 2017 at the Eusbett Hotel, Sunyani Brong Ahafo Region. This second session in Sunyani will mainly focus on Improved Planting Material development, establishment of new plantations and design of adult training programme among others. Participants will be introduced to Monitoring and Evaluation and Gender and Cashew value chain promotion. At each session, there is a combination of topics on self-reflection and perception management and on behaviors and values that affect learning and teaching skills. The highlight of this session will be a field visit to the Cocoa Research Institute of Ghana (CRIG) research station and farm visits in the cashew production areas around Sunyani. “The Cashew Master Training Programme is an important "next step" in the concerted collaborative efforts and work done by the Ministry of Food and Agriculture, the Ministry of Trade and Industry, the Cocoa Research Institute, ComCashew and the African Cashew Alliance to improve the Cashew sector in Ghana.” – Hon. Archibald Yao Letsa, Volta regional minister. Rolled out in seven months, the Master Training Program is divided in three successive sessions to be held in Ghana and Côte d'Ivoire. In so called “inter-sessions”, the participants return to their host institutions to conduct field work, either individually or in groups, to deepen knowledge on a selected topic. After completion of the program, the participants become acknowledged cashew experts. They either train farmers, provide assistance to processors, or advice institutions in their home countries. At the heart of the Master Training Program are facilitators and technical experts who teach, evaluate and potentially re-design each training session according to participants’ needs. The training contents are developed with great support and commitment from various ComCashew partners. They use stimulating presentations, interactive role plays and lively discussions to deliver trainings. The Competitive Cashew initiative (ComCashew) constitutes a new type of multi‐stakeholder partnership in development cooperation. Since its inception in 2009, around 440,000 new jobs have been created in Benin, Burkina Faso, Côte d'Ivoire, Ghana and Mozambique – 75 per cent in production, 20 per cent in trade and 5 per cent in processing. In Ghana, the initiative has trained more than 40,000 farmers and has created over 46,500 jobs in production and processing. In the area of processing, the project has given technical support and assistance to 7 processors. The Deutsche Gesellschaft für Internationale Zusammenarbeit GIZ (GmbH) has been commissioned by the German Federal Ministry for Economic Cooperation and Development (BMZ) with the management of the project. ComCashew benefits from the diverse commercial and technical expertise of their private and public-sector partners. Key cooperation partners in Ghana are the Ministry of Food and Agriculture (MOFA) and the Cocoa Research Institute of Ghana (CRIG). District and Municipal Chief Executives as well as all directors of Ministry of Food and Agriculture (MOFA) in the Brong -Ahafo Region have been sensitised on a new agriculture programme which government will soon launch to ensure food security and raw materials for industries. The programme, which will pay special attention to selected cash crops namely Cashew, Shea, Mango, Citrus, Cocoa, Rubber and Oil Palm, will be launched jointly by the Ministries of Food and Agriculture and the Local Government and Rural Development. The 11th Annual Cashew Conference organized by the African Cashew Alliance (ACA), scheduled to take place from 18 to 21 September 2017 in Cotonou, has officially been launched in Abidjan. The Conference, to be organized in collaboration with the Benin Value Chain Association and the Government of Benin, aims to serve as a platform to encourage strategic partnerships, Investment, sharing experiences and doing business. The African Cashew Alliance (ACA), following a grant awarded from the African Development Bank (AfDB) under the Africa Trade Fund (AfTra) currently has openings for consultants to implement an extensive technical assistance program for cashew processors in 8 countries in East and West Africa. The project seeks to improve product quality and marketing development in line with international best practices for poverty reduction; increase competitiveness, incomes and employment for cashew processors in East and West Africa; promote the participation of women in cashew processing; and improve environmental standards and sustainability in African cashew processing. For more information on the project, please visit the ACA website. On 7 and 8 July 2017, the world's eyes will be on Hamburg, when the heads of state and government of the 19 major industrialised and emerging nations and the EU meet for the G20 Summit. One of the central topics at this meeting will be Africa and how to secure sustainable economic development on the African continent. The Competitive Cashew Initiative offers a prime example of how to achieve this. This edition highlights the activities of ComCashew and its partners in sector organisation in its project countries as well as other African cashew-producing countries. Information on the cashew harvest season in our project countries and the state of the cashew market this year are also provided. Enjoy reading the bulletin! GEPA is, meanwhile, proposing a surcharge on raw cashew exports to encourage more local processing of the nuts. Chief Executive Officer of GEPA, Ms Gifty Klenam, said in an interview that the move was to ensure local processors get raw cashew for grinding and value-addition so as to increase the earnings Ghana gets on the world market instead of exporting the commodity in the raw form. The 2017 edition of the European Development Days – EDD17, opened in Brussels on June 7, 2017. The two-day event will June 8, 2017.Organised by the European Commission, the European Development Days (EDD) bring the development community together each year to share ideas and experiences in ways that inspire new partnerships and innovative solutions to the world’s most pressing challenges The European Development Days is Europe's leading forum on international cooperation and development. EDD 2017 will promote a new global strategy to address the most pressing current global development challenges and bring together development actors committed to tackling poverty worldwide, with a particular emphasis on engaging the private sector as a partner in economic development. The forum builds on the core belief that cooperation is crucial to achieve real change towards a poverty-free and sustainable world where everyone has the prospect for a decent life. An essential aim is thus to inspire the desire to work together in a spirit of true partnership through facilitating networking. It also aims to achieve inclusive and sustainable growth, creating decent jobs, particularly for women and young people through investment, in particular with the full engagement of the private sector both as an economic and responsible actor in development. The Ghana Export Promotion Authority (GEPA) has asked the central government to place a cap on the volume of raw cashew that can be exported from Ghana. Chief Executive Officer (CEO) of GEPA, Gifty Klenam made the call on Friday, 2nd June, this year, in Accra, saying it has become imperative for government to impose limitation. Ms Klenam, speaking to the media at her office, said if government cannot place a cap on raw cashew export, then it should surcharge it as an alternative. That, she said, was because about 90 percent of Ghana’s cashew were being exported raw by foreigners, particularly Indians, Vietnamese, Lebanese, among others, without leaving any significant quantity for local companies, who want to do value addition. Ghana became the seventh Cashew producing African country to sign onto the Consultative International Cashew Council (CICC), an international organization with legal capacity and financial autonomy responsible for promoting the sustainable development of cashew in the world. The Ministry of Food and Agriculture (MoFA), represented by the deputy minister in-charge of perennial crops, Hon. William A. Quaitoo signed the convention to officially make Ghana a member of the international body. The signing ceremony held in Accra on Monday June 6, 2017, was witnessed by the Director General of the Cotton and Cashew Council (CCA)of Côte d'Ivoire Dr. Adama Coulibably and representatives from the Ministry of Local Government and Rural Development, Ministry of Trade and Industry, the Ghana Cashew Industry Association (CIAG), the African Cashew Alliance (ACA) and the Competitive Cashew initiative (ComCashew). The CICC aims to create a consultation framework and collaborations between member states for a sustainable cashew sector. Ghana has complemented the process for the establishment of the CICC and as a result hosted the first consultation meeting in Accra in April 2016. So far, six cashew producing countries in Africa have signed the convention, they are; Côte d'Ivoire, Benin, Burkina Faso, Guinea Bissau, Senegal and Togo. Ghana is the first Anglophone country to become a member state of the Consultative International Cashew Council. Over the last decade, cashew has gradually emerged as an important part of Africa’s economy. Cashew production in Africa has grown impressively in the past years from 1.2 million tons in 2014 to 1.8 million tons in 2016. Also, the value addition segment has increased from 35,000 MT in 2006 to about 145,000 MT in 2016. The African cashew industry could benefit immensely by capturing the value of its raw nut production through increasing processing on the continent. In West Africa, Ghana has a comparative advantage due to continuous investment in cashew research by the Ministry of Food and Agriculture and the Cocoa Research Institute of Ghana. This has resulted in high productivity and quality of the cashew crop. Ghana has 14 installed raw cashew nut processing units, with a total capacity of 68,000 MT. However, only about 15,000 MT is currently being processed in 2 of the 14 processing units. Ghana’s new government has made their dedication to the promotion of agriculture evident from the start with a pledge to spread industrialization across the country, on the “one district, one factory” policy. The government is also putting in place a cashew board to govern and regulate the cashew sector as well as to develop favorable policies to leverage existing efforts and promote investments in the sector. The Consultative International Cashew Council is an international organization, steered by the Ministries responsible for cashew in its Member States. The Council of Ministers, of which Ghana is now a member, meets annually as the decision-making body for the development of the cashew sector. Thus Ghana can contribute to the harmonization of policies in the region and profit from the exchange in the technical bodies for private sector promotion, cashew research along the value chain and production. Every year on June 5 people around the world observe world environment day. The day is all about raising awareness about nature and the importance of protecting it. Since its inception in 1972, people worldwide have organized events, from neighbourhood clean-ups, to action against wildlife crime, to replanting forests to observe the day. This year’s host country Canada chose the theme “connecting people to nature” and will be at the centre of celebrations around the planet. As part of activities to celebrate the day, staff of GIZ/ComCashew in Accra is embarking on a tree planting exercise, as their own small way of protecting the environment for future generations. The cashew value chain is recognized as an environmentally sustainable one. The cashew tree is known to be very robust and able to withstand harsh, climatic conditions with low rainfalls and thus lower soil fertility. That said, research has established that Cashew as a tree crop will be suitable for the purposes of Climate Change Adaptation and Mitigation. The production systems of the crop are generally extensive and do not require a lot of inputs like Fertilizer and irrigation. Similarly, the crop is known to grow very well in marginal soils. Cashew production also promotes afforestation and soil conservation. Moreover, cashew producers are able to intercrop with other food crops, a practice which enhances productivity and income diversity and maintains soil fertility. Cashew trees are also good for beekeeping and therefore promote biodiversity. Research shows that where bees are integrated into cashew farms there is an increase in yield levels as a result of pollination. Plant a cashew tree today; you will be doing the environment a world of good! 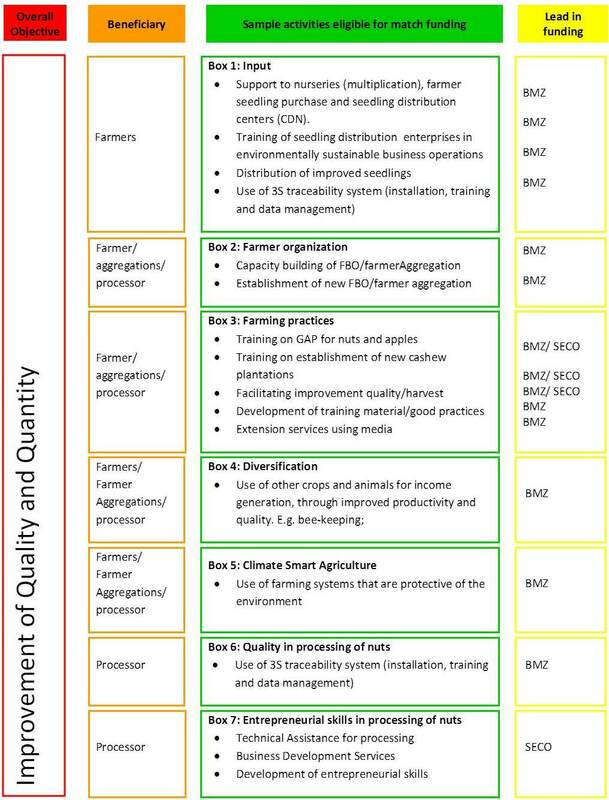 This step comes as part of the facilitation process for a 10-year National Cashew Development Plan (2017-2027) which has been drawn by key stakeholders to regulate the Ghanaian cashew sector. On Tuesday, May 16, 2017, a Trilateral Cooperation Project between Ghana, Brazil and Germany was launched to accelerate and revolutionize Cashew Research Activities and to increase Cashew By-Product Processing in Ghana. The Trilateral Cooperation which will see the investment of €700,000 euros in the cashew sector is an initiative of the Government of Ghana through the Ministry of Food and Agriculture (MOFA) and the Ministry of Trade and Industry (MOTI), the Government of Brazil through the Brazilian Cooperation Agency (ABC) and the Government of Germany through the Federal Ministry for Economic Cooperation and Development (BMZ) to strengthen cross-regional technical cooperation. The objective of the cooperation is to complement technical contributions and to apply specific knowledge, skills and experience of the three countries. The implementing institutions are the Ministry of Food and Agriculture (MoFA), the Brazilian Agricultural Research Cooperation (Embrapa) and the Deutsche Gesellschaft für Internationale Zusammenarbeit (GIZ) GmbH through the Competitive Cashew initiative. Partners to this cooperation, so far, include the Cocoa Research Institute of Ghana as well as the African Cashew Alliance (ACA). The project aims at accelerating research on high quality cashew varieties that are tolerant to major diseases and pests and well adapted to local conditions. The second focus of the project is to promote cashew shell and apple processing technologies and marketing to increase the competitiveness of the value addition segment in the cashew value chain. The Launch of the Trilateral Cooperation was followed by a field trip to the Wenchi Agricultural Research Station, the Cocoa Research Institute of Ghana, private nursery operator Tree Global as well as USIBRAS, the largest cashew processing factory in West Africa to examine and understand the status quo of cashew research and processing in Ghana. Discoveries from the field trip and technical inputs from Ghanaian partners shaped the foundation for a two-day Internal Planning Workshop that defined the expected outcomes of the project, planned activities and the set standard for communication, coordination and transparency among partners as well as to monitor and evaluate project activities. implementation of planned activities is scheduled to commence in August 2017. The International Nut and Dried Fruit Council (INC) celebrated the 36th Edition of the World Nut and Dried Fruit Congress for the first time in India from May 19 to 21 at the ITC Grand Chola in Chennai. The INC Congress witnessed the largest international gathering of food professionals, suppliers, traders and buyers from the nut and dried fruit business with nearly 1,000 attendees from across 60 countries. A rountable on cashew was chaired by Hari Nair. ComCashew was represented at the event by our director for private sector development, Madam Mary Adzanyo. As part of the implementation of the cashew nut quality platform activities in Cote d’Ivoire, the Cotton and Cashew Council (CCA), organized a training workshop for Farmer Based Organizations (FBOs). The training which took place in Grand Bassam was to provide the FBOs with the necessary knowledge and equipment to perform cashew quality test and analysis. A total of 60 KOR Kits acquired with the support of ComCashew and PSAC were awarded to the best 60 cashew FBOs in order to enable them to analyze the quality of their products at farm gate level. The Director General of the Cotton abd Cashew Council in Cote d’Ivoire who spearheaded the kits distribution ceremony used the occassion to thank ComCashew and the other technical and financial partners, in particular the PSAC, for their continuous support that is aimed at preserving and promoting the quality of cashew nuts from Cote d’Ivoire. The Executive Director of Competitive Cashew Initiative (ComCashew) Rita Weidinger, disclosed this at the 4th Edition of the Master Training Program to promote the African Cashew Value Chain in Ho today. The five-day training programme is a joint initiative of ComCashew and the African Cashew Alliance (ACA) with support from the Cocoa Research Institute, Ghana (CRIG) and the Ministry of Food and Agriculture (MOFA). This was announced by the executive director of the competitive cashew initiative ( comcashew ) Rita Weidinger at the 4th edition of the master training program held in Ho. The five day training program which is aimed at promoting the African cashew value chain is a joint initiative of the Comshew and the African cashew alliance with support from the Cocoa Research Institute, Ghana (CRIG) and the Ministry of Food and Agriculture. Rita Weidinger says, Ghana continues to lead the way in high yields of 800kg/hectares as against the international benchmark of 1500kg/hectares. She added that processing remains a challenge in Ghana and the sub-region. The Competitive Cashew initiative (ComCashew) together with the African Cashew Alliance(ACA), with support from the Ministry of Food and Agriculture (MOFA) and the Cocoa Research Institute Ghana (CRIG), will hold the 1st session of the 4th edition of the Master Training Program for Cashew Value Chain Promotion from Monday, 8th to Friday, 12th May 2017 at the Chances Hotel, Ho, Volta Region. The program provides a platform for 75 cashew experts coming from Benin, Burkina Faso, Cameroun, Côte d’Ivoire, Gambia, Ghana, Mali, Mozambique, Sierra Leone, Tanzania, Togo and Zambia to share knowledge, discuss best practices and lessons learnt as well as to build national and regional networks for future collaboration. Returning to their host institutions, the participants will have a multiplier effect on the cashew industry when sharing their knowledge and experiences gained by attending this tailor-made training. During knowledge sharing sessions of theories and their application, participants learn about all aspects of the cashew value chain from production and processing of raw cashew nuts, to economics, cashew market dynamics, marketing and financing mechanisms. Facilitators and technical experts teach, evaluate and re-design each training session according to participants’ needs. The first session in Ho, will cover the cashew value chain concept, the dynamics of the cashew market and training material development. The highlight will be a field visit to the largest cashew processing factory in the subregion - USIBRAS, in Prampram. All sessions cover cross-cutting issues such as gender, policy development, sector regulations and nutrition value of cashew products. Seth Osei-Akoto, Director Crop Services MOFA, states: “We, in Ghana, are amongst the first to develop and distribute improved planting materials on a carefully planned and sustainable manner. In collaboration with CRIG, we have so far supplied at least 400,000 improved cashew grafts to farmers in the Northern, Volta and Brong-Ahafo regions and we have planted 4,000 hectares of new cashew plantations.” In the sub-region, Ghana serves as a role model in cashew research and the development of improved planting materials. The Competitive Cashew initiative (ComCashew) constitutes a new type of multi‐stakeholder partnership in development cooperation. The initiative is mainly funded by the German Federal Ministry for Economic Cooperation and Development (BMZ) for its third phase which started from May 1, 2016. Private companies and government and donor agencies also support the Initiative. The Deutsche Gesellschaft für Internationale Zusammenarbeit (GIZ) GmbH has been commissioned with the management of the project with Fairmatch Support as an implementing partner who provides consultation on technical issues and facilitate linkages between farmers and processors. ComCashew benefits from the diverse commercial and technical expertise of their private and public sector partners. Important cooperation partners in Ghana are the Ministry of Food and Agriculture (MOFA) and the Cocoa Research Institute of Ghana (CRIG). Every year, workers all over the world commemorate this day whose origins lie in the industrial sector of the early 20th century, by addressing major challenges of the modern industry such as fair wages, good working conditions and job security. Twentieth century industrial society required a larger workforce as majority of men had been enrolled to fight in the world war. This saw more women joining the workforce. This essentialist role of women in crisis times contributed to the rise in the women labour. Twentieth century European history seems to have paved the way for women’s employment in the industrial sector and subsequently for further professional possibilities regardless of the sector. In Africa, female employment rate is steadily rising but not without challenges. Considering that the global demand of for cashews is increasing globally, the sector is expected to offer more jobs throughout the developing cashew value-chain. So far, ComCashew and partner interventions have already created more than 21,000 jobs in cashew processing industry, 80 % of them for women. On the production side, ComCashew and partners have trained more than 400,000 farmers, about 22% women, on Good Agricultural Practices. The development of the cashew sector and women’s employment go hand in hand. Together, they have a great potential to contribute to the economic growth of cashew-producing countries and thereby, contributing to poverty reduction. The cashew sector can currently boast of prominent women professionals who have paved the way for others in the generally male-dominated sector. As we celebrate the International Workers’ Day, consider investing in the cashew sector. Contribute to a reduction in Africa’s unemployment and poverty rate and help your country’s society progress and pave new ways. Today, we celebrate cooperation of workforce, for women and men, and its gift of independence for everyone. on Cashew (CIESA) from 26 to 28 September 2017 in Abidjan (Côte d’Ivoire). Abstracts for oral and poster presentations are invited on the below conference topics and should be submitted using the online abstract submission system (www.redaa.org). We welcome your participation and look forward to receiving your abstract. Please download the files below for detailed information on abstract preparation. These trees have changed my life, they have made me a happy woman,’ says Victoria Ataa, lovingly patting the bark of the tree that provides her with shade from the midday sun. The Ghanaian farmer is seated under a cashew tree in the village of Congo. Its fruits have not only freed the 66-year-old from abject poverty, they have also made her a role model for thousands of other farmers across Africa. board member of ComCashew and as such, sat in this meeting. to help address challenges confronting stakeholders in the cashew industry. He made this call during a stakeholder visioning forum in Accra on Wednesday March 29, 2017. The forum brought together various actors to formulate a ten-year vision for the cashew sector until 2017.
of Nigeria and the National Council of Benin Cashew Exporters. Another eight agreements were also reached by cashew exporters and importers at the event. about one million tonnes of raw cashew nuts annually for the past two years. Mr. Dahiya made this known at a Cashew Stakeholder Forum in Acrra on Wednesday March 29, 2017.
players along the cashew value chain. session to discuss partnership with the newly established Cashew International Consultative Council (CICC). Côte d’Ivoire (CCA) which manages the new international cashew body (CICC). Half of all the world's cashews are produced in Africa. The cashew sector provides more job opportunities for women and for many families, it is an extra source of income. several Projects work along the cashew value chain and are committed to more jobs and higher annual salary. The total export revenue realized from cashew production in Ghana in 2016 was US$244,500,000, making the commodity the leading non-traditional crop export revenue generator. Ghana produces between 50,000 to 70, 0000mt of raw cashew nuts annually, but it exports far more than that figure. Mr. Owusu attributed it to the conducive business environment in the country, thus making Ghana a preferred destination in the Sub-Region for cashew traders across the world. ACA Annual Cashew Conference 2017 - Registration now Open!! The African Cashew Alliance is excited to announce the 11th ACA Annual Cashew Conference, which will be held in Cotonou, Benin from the 18th to 21st of September 2017! With the theme “A New Vision for Partnerships and Investments”,this year’s conference will serve as an important platform for creating a new vision for the African Cashew Industry, sharing knowledge and best practices, networking and doing business. Be on the lookout for a detailed program, which will feature seasoned speakers to address the pressing issues of today’s industry! The country is now the second largest exporter of raw cashew nuts in the world. Register before June 30th, 2017 to take advantage of the early bird rates! ACA members will also receive a special discount on conference fees. Make sure to take advantage of this great offer! Sponsoring and exhibiting at Annual Cashew Conference is an excellent opportunity to promote your company to a wide variety of cashew stakeholders from all over the world. Visit our website, www.africancashewalliance.com for more details! For any questions, please contact the ACA Secretariat at aca@africancashewalliance.com or call +233 302 78 22 33. ComCashew contributed to the preparation of a report on “Enabling the Business of Agriculture” prepared by the World Bank. Our contribution was on requirements for the trade of raw cashew nuts from Benin and Burkina Faso. See below the link to the final report which covers 62 countries. The report highlights trade regulations in 62 countries across the world. The cashew sector has seen the emergence of determined women over the past couple of years. These women have played influential roles in major positive developments within the sector from production, through processing to sector organisation. The Competitive Cashew initiative recognizes the role of women in the development of the African cashew sector. Among other things, ComCashew focuses on trainings and skills development of female farmers, processors and other female cashew experts. So far, about 80, 000 female cashew farmers have been trained on topics including Good Agricultural Practices (GAP) and harvest and post-harvest techniques. ComCashew through the Master Training Program works to develop the capacity of women to encourage a more active participation in leadership roles in the sector. In celebration of this year’s International Women’s Day, we share some of the inspiring stories behind the success of dynamic women in the Cashew sector. The International Cashew Advisory Council (CICC), the body responsible for the global macroeconomic management of cashews, was presented Thursday at the Paris International Agricultural Show (SIA 2017) On the occasion of the promotional day organized by the Côte d'Ivoire cotton and cashew nut council. During this session, the Director General of the Ivorian regulator of the sector, Coulibaly Adama, presented the vision, objectives, bodies, members, organization and practical operation of the CICC, Baptism on November 18, 2016. The demand for cashew nuts is growing - but African farmers miss out on most of the benefits. That's because most of the value of the nuts comes from processing - and that happens somewhere else. David Signer embarked on a fact finding mission to Ghana to find out how the most talked about emerging cash crop “Cashew” is produced. This comes just months after group journalists numbering about 11 undertook a similar journey to Ghana last November. The role of ComCashew and partners as well as their investments in the development of the cashew sector in Ghana. Cashews are a major export crop for Tanzania and a significant source of income for many small farmers. But value addition in the form of processing of raw cashew and capacity building in this sector is wanting. The lack of local processors in Tanzania means there are very few jobs created from this valuable commodity; cashews are an important foreign exchange earner for the country. Fahad Awadh, an ambitious 29-year old entrepreneur from Tanzania, recently moved back home from Canada to set up a cashew processing facility in Tanzania in an effort to bring international standards and traceability to the cashew nuts. He is the founder of YYTZ Agro-Processing, a cashew processing company that is adding value locally while creating jobs and boosting the income of farmers and the community as a whole. With support from the African Development Bank (AFDB), Burkina Faso has been awarded a US $4-million loan from the Climate Investment Funds’ Forest Investment Program (CIF FIP), to revive its cashew sector and mitigate climate change, working through an innovative public-private sector business model between the national union of farmers’ cooperatives and the government. Between 2010 and 2015 alone, GIZ has helped put an end to hunger and malnutrition for some eleven million people. At its stand, GIZ informed visitors of the support it has provided to cashew farmers in Africa on behalf of the German Government, and how this has improved for example cashew cropping and marketing and greatly increased farmers’ income. To date, to the surprise of many visitors, ComCashew measures have benefited more than 400,000 smallholders, enabling them to raise their net cashew-based income by around USD 160 – with some farmers now earning twice what they did before. The GIZ booth was met with great interest and led to many interesting discussions around cashew. The visitors were taken aback by the effort and time put into the whole process of cashew sector development. Visitors asked questions such as “how does it grow? what does it take to transform RCN to a consumable cashew nut?” among others. Following the invitation to visitors of the booth to answer three quiz questions, and being confronted with the rewarding choice of chocolate, moringa smoothie or cashew nuts most chose cashew. This high interest led to a distribution of almost 4,000 small (50g) cashew packages which were thankfully contributed by ComCashew partners, Intersnack and TDG. ComCashew also used alternative publicity opportunities such as inviting the excellent professional cook, Moritz Katz, for a cooking show that was highly appreciated by visitors to the stand. In addition to that, a large stage was made available to families and school classes for an interactive learning experience on cashew, crowned with a cashew prize. The trip which lasted from 5th to 9th September, 2016 was an opportunity for the journalists to interact with beneficiaries of GIZ. Following their visit, the journalists have published articles on their visit in various German press.